The Los Angeles Dodgers have climbed to the top of Box-Toppers rankings among National League teams, passing the St. Louis Cardinals, who were the top NL team for more than four months. Meanwhile, the Detroit Tigers maintain their perch atop all teams in Box-Toppers power rankings for the fourth straight week. 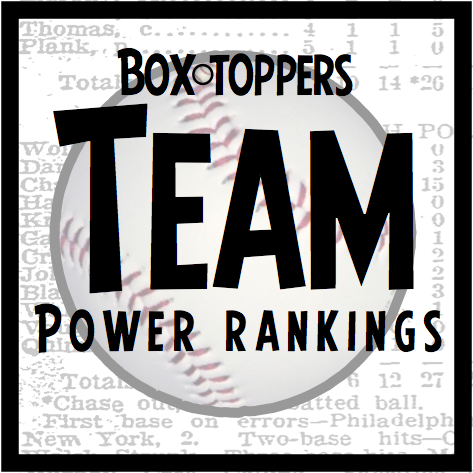 Dodgers players have accumulated 99.0 Box-Toppers points, rising from fifth to third place among all teams. They narrowly edge the Cardinals, with 98.9 points, which fall from fourth to fifth place overall. The Cardinals have held the lead in Box-Toppers points among NL teams since April 25. The Dodgers started the season as a pre-season favorite to win the World Series, but languished in the standings early in the season. They did not debut in the Box-Toppers list of top 10 teams until July 25 and have steadily climbed in the standings each week. The Dodgers and the Texas Rangers both have 99.0 Box-Toppers points for the season, but the Dodgers edge out the Rangers because they accumulated more points over the past week (5.0 vs. 4.0). The Pittsburgh Pirates were the hottest team of the past week, accumulating 7.5 Box-Toppers points, giving them 91.0 for the season and rising from 12th to ninth place in the rankings.